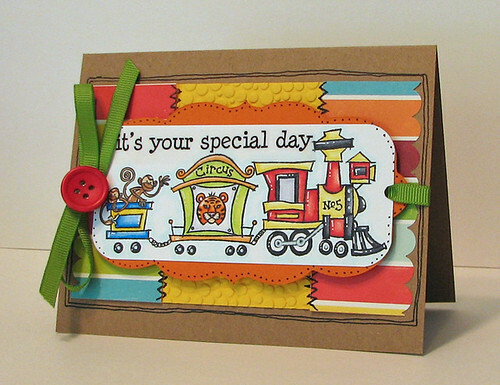 Here is a fun train card that I made from sketch 236 at CPS this week. I used an older Stampin' Up! stamp set for the train image and I colored the image in with my Copic markers. I also added a fun SRM Sticker for the sentiment. The orange label is cut from my Cricut and Once Upon A Princess cartridge. Don't forget about the MyMemories Suite digital scrapbooking software giveaway I have going on right now....if you ever wanted to try digital scrapbooking, this is a fabulous program to get. I will be drawing a winner sometime tomorrow, plus I have a discount code available exclusively for my readers. Click HERE to check it out. Wow Amy, this is so beautiful! I love the train image and all the little details in the pic! That little monkey is CUTE! Great card! So cute and colorful! LOVE that train! Your card is so cute. Love the bright and cheery colors and the train is adorable! TFS! Super cute card. Great colors. Love the bright, cheerful colours. Awesome card!